The likes of OgilvyOne Worldwide, IDC, Gartner and a plethora of other market intelligence firms have reported on the whole catch all “BigData” in one wave shape or form. Ogilvy have excelled themselves though with a whole day in the life. A day in Big Data…. It paints a picture for the next five years for sure, the video is nice all in all with it’s large glass interactive displays and NFC enabled retailers. There’s some issues though in my eyes…. Collectively 2.7 Zetabytes (“that’s 27 with 21 0’s after it”) , 27,000,000,000,000,000,000,000 may exist in the universe as it stands. Joe Retailer won’t be dealing with a point of a point of 1% of that in any given situation. Even large department stores (the Tesco’s and M&S’s of this world) aren’t concerned about the whole historical evolution of the customer. They’re bothered about the relevancy, recency and value. A month of recent transactions is still worth it’s weight in gold for most. The 90% figure is that IBM statistic wheeled out again (and again, and again and again….). The video itself doesn’t really touch much in the way of big data in my opinion. The Skyping as soon as you wake up, well I need at least two coffee’s before I can considering looking at Skype, let alone talking to anyone. There’s some nice ideas about the congestion updates in realtime, something that would be a good thing. Paper voucher for a coffee! No! SMS me :). Bricks and mortar stores could benefit from some of the ideas but most of the data driven ideas are rooted within point of sale (POS). One issue I do have….. checking in…. I’ve mentioned this before. 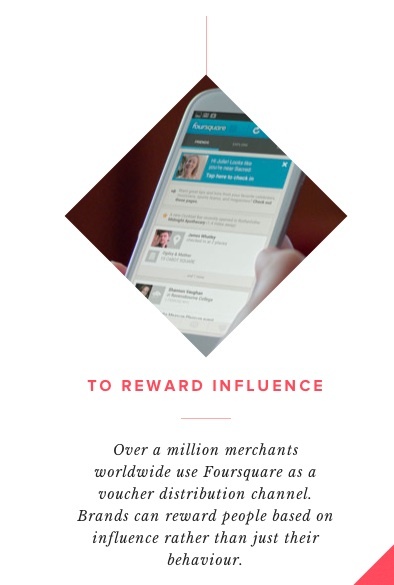 Foursquare being used as a voucher distribution channel still doesn’t work for me. Check-ins by their very nature are selective by the user. And check-ins are in decline for the simple reason, no real reward to do so. In the years I’ve been using Foursquare I’ve had to be the mayor of somewhere to get a very sub standard offer. I’m not sure retailers actually took it seriously at all as a tool but just something else to update. Voucher applications are dicey as a concept. Passbook came and went, adoption was (and will always be) creeky slow. uVoucher and a dozen other voucher based apps never really go past the prototype stage and if there’s no POS integration then there’s no point. It’s all nice in theory but there’s that lingering doubt of whether we’ll really do all this. Yesterday during meetings I didn’t check in, the coffee place didn’t do any offers I was aware of. I certainly didn’t NFC my way past anything, except the bus driver….. we’re all pretty stuck in our existing ways because the just work for us.